During John’s childhood, the Spence family moved to Beatrice, Nebraska. He received his B.F.A. and M.F.A. degrees in photography from the University of Nebraska in Lincoln, then worked for Nebraska Public Television for five years in the film unit before starting his own business as an independent film and video producer. From 1972 to 1982, his photographic work focused on black and white portraiture using an 8 x 10 inch camera. 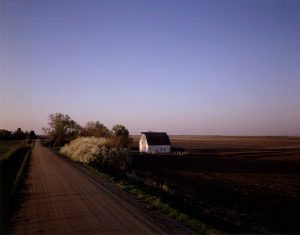 Starting in 1982, he began photographing the Midwestern landscape, switching to digital photography in 2009. His work has exhibited nationally and internationally, including a show at the Nikon Salon in Tokyo, Japan. Spence has been a guest lecturer in photography at universities across the country, has published four books that feature his photography, and has produced 12 films highlighting visual and other artists. He is represented by Nebraska galleries in Omaha and Lincoln. One of his commissions is a set of large color photographs of the Nebraska landscape displayed in the state’s Capitol. He has been recognized with a Mid-America Arts Alliance/National Endowment for the Arts Fellowship in Photography; an independent film production grant from the Southwest Alternate Media Project in Houston, Texas; a Corporation for Public Broadcasting Award for Best Cultural Affairs documentary; and a 1994 Nebraska Arts Council Individual Artist Fellowship. The Museum of Nebraska Art has 16 works by John Spence.